Revenue in the Fashion segment amounts to US$280,743m in 2019. Revenue is expected to show an annual growth rate (CAGR 2019-2023) of 11.5%, resulting in a market volume of US$433,361m by 2023. The market's largest segment is Apparel with a market volume of US$183,181m in 2019. In global comparison, most revenue is generated in China (US$280,743m in 2019). The eCommerce market segment Fashion includes the online trade of articles of apparel (for men, women and children), shoes and shoe care products (e.g. cleaning products) as well as accessories and bags (e.g. hats, scarves, gloves and leather bags, suitcases, purses and briefcases). Dedicated outdoor and sports apparel, outdoor and sports shoes as well as baby’s clothes are part of other categories (see: Toys, Hobby & DIY). Also, the purchase or resale of used apparel articles is not included in this market segment. All monetary figures refer to the annual gross revenue and do not factor in shipping costs. Reading Support Revenue in the Fashion segment amounts to US$280,743m in 2019. Reading Support The Fashion segment is expected to show a revenue growth of 15.8% in 2020. E-invoice: the electronic invoice is issued at the checkout by the payment provider, who performs an instant credit check and carries the fraud risk. The customer later pays directly using their preferred method (e.g. Klarna). Reading Support In the Bags & Accessories segment, the number of users is expected to amount to 432.0m by 2023. 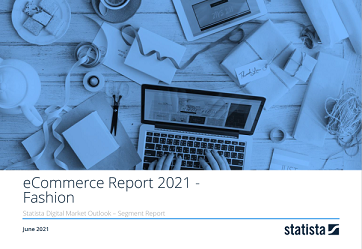 Reading Support User penetration in the Fashion segment is at 58.4% in 2019. Reading Support The average revenue per user (ARPU) in the Bags & Accessories segment amounts to US$158.09 in 2019. The following boxes show the top 5 online stores by eCommerce net sales (first party sales) in the Fashion segment in China. Data basis for net sales and market share are company surveys, annual reports and a complex sales forecast model developed by Statista. Reading Support In the year 2017 a share of 34.0% of users is 25-34 years old. Reading Support In the year 2017 a share of 54.2% of users is female. Reading Support In the year 2017 a share of 37.8% of users is in the high income group. Reading Support With a market volume of US$280,743m in 2019, most revenue is generated in China. Here you can find more studies and statistics about "Fashion".